Karia from Kouture Crochet is currently Kickstarting a line of handspun single sheep breed yarns. Her plan is to make more than 24 yarns available, each spun out of the wool from a single breed of sheep! 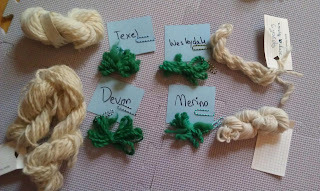 Karia sent me some samples to help me out with a dyeing experiment I've been wanting to try: How well do different types of wool take up dye? 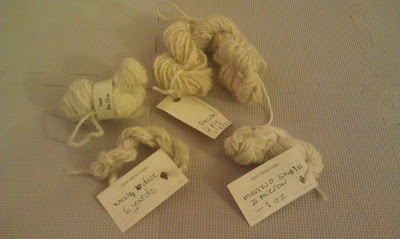 Karia provided me with handspun 2-ply Wesleydale, Devon and Texel in addition to some single ply Merino. 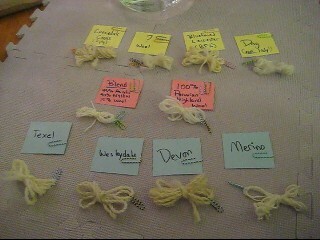 All of the samples took up dye beautifully. It is a little hard to see from the picture, but of the 10 samples, the Commercial Peruvian Highland wool took up the most color (or at least is the most blue green because it started out as a pure white rather than ecru.) 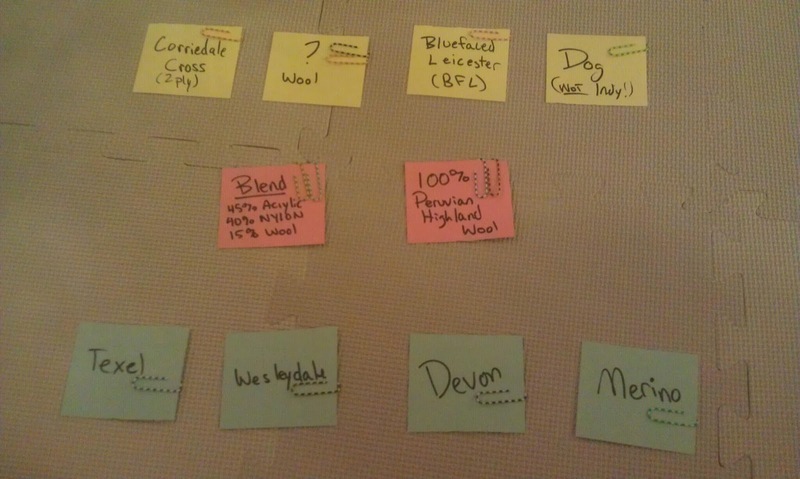 The handspun breeds that took the most color are the Devon, Texel and ? Wool. The Acrylic/Nylon/Wool Blend has a color that is very different from the rest, even though it didn't appear very yellow compared to the rest at the beginning. Maybe this is just the way that nylon takes up food coloring... Finally, I am excited to see that you can also dye non-conventional animal fibers (i.e. Dog) with this method. 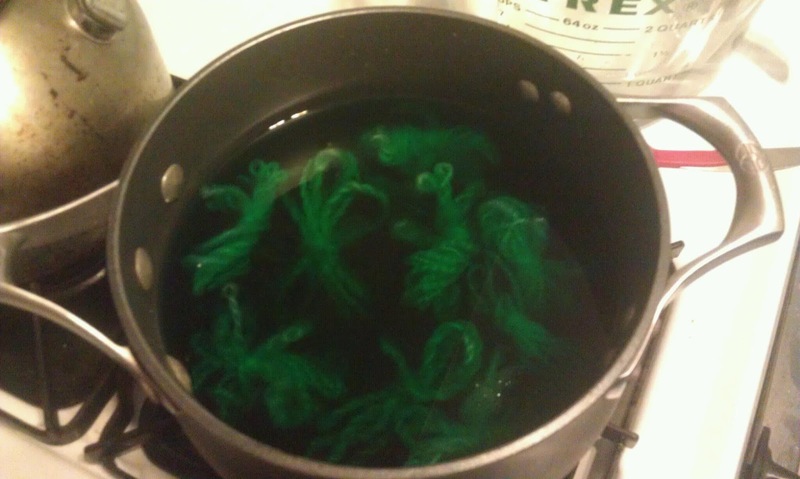 I learned something else from this dyeing experiment. This is something that I've noticed in the past, but haven't payed to much attention to... Hot water fluffs up yarn. A lot. This made all of the hand spun yarns open up and be bouncy and beautiful. I've been worried about over twisting in some of my own handspun yarns, maybe I should try giving them a hot water bath. (I know that some people soak the yarns in hot water and smack them to set the twist... maybe this is what I need to do rather than just wet and dry on the niddy noddy.) Please let me know if you have any insight to this! I am really impressed by Kouture Crochet's inspiration to create single breed yarns. 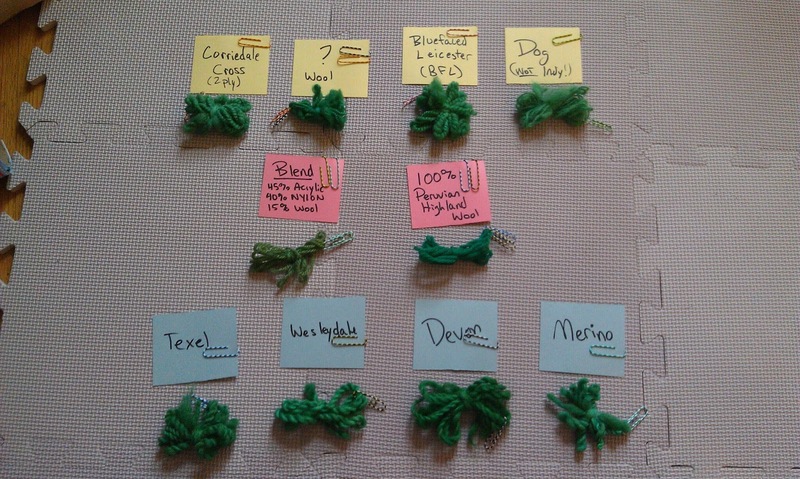 I am trying to spin as many types of wools as I can myself so I can figure out what I like to work with the best. This is a great opportunity for knitters, crocheters and other types of fiber crafters to learn about different breeds of sheep. Make sure you check out her Handspun Single Sheep Breed Yarns Kickstarter Project!